The massive rally and the EC’s move came after Chief Minister Lal Thanhawla wrote to Prime Minister Narendra Modi demanding Shashank’s removal. Thousands protest outside Mizoram Chief Electoral Officer S B Shashank’s office. 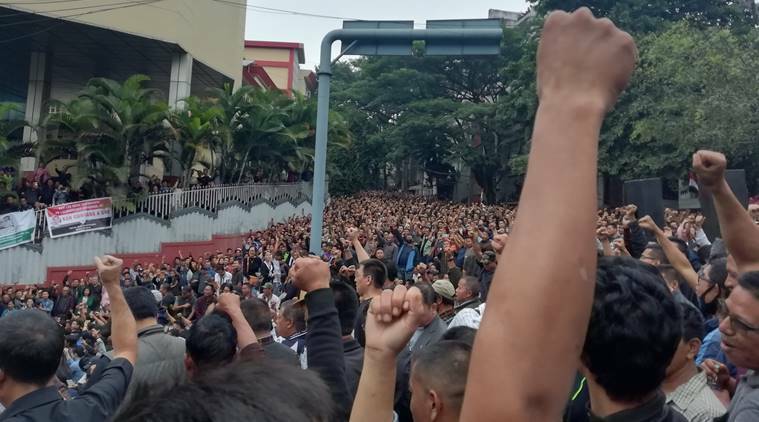 OVER 40,000 people took part in a rally in Aizawl Tuesday morning to demand the removal of Mizoram’s Chief Electoral Officer (CEO) S B Shashank over allegations of bias in the conduct of the upcoming polls, officials said. The Election Commission (EC) has dispatched a three-member committee to the state to resolve the issue. The massive rally and the EC’s move came after Chief Minister Lal Thanhawla wrote to Prime Minister Narendra Modi demanding Shashank’s removal. The EC team, led by Jharkhand CEO L Khiangte, has begun meetings with the Mizoram Chief Secretary and representatives of civil society groups that have been demanding Shashank’s transfer. In a letter to the EC, the Federation of Mizoram Government Employees and Workers has threatened that unless Shashank is transferred out of the state before 4 pm on November 9, its members would not cooperate in the conduct of polls in the Congress-ruled state on November 28. Protesters held placards and raised slogans against Shashank and the Elections Commission (EC). As first reported by The Indian Express on November 1, Shashank had complained to the EC of “direct interference” by the state in the preparation for polls following which the Commission ordered the removal of Mizoram Principal Secretary (Home Department), L Chuaungo. In his complaint, Shashank had alleged insensitivity on part of the state regarding the voting rights of the displaced Bru community, which is based in relief camps in Tripura, and referred to the “active role” played by Chuaungo in the revision of electoral rolls and deployment of central forces. The protests will continue tomorrow. Over 30,000 Brus were displaced from Mizoram 21 years ago following ethnic clashes, with many of them living in six camps in the Kanchanpur and Panisagar sub-divisions of North Tripura. In July, the Union Home Ministry announced that an agreement for their repatriation has been signed but only around 180 people were shifted. There are over 10,000 registered voters in the Tripura camps. 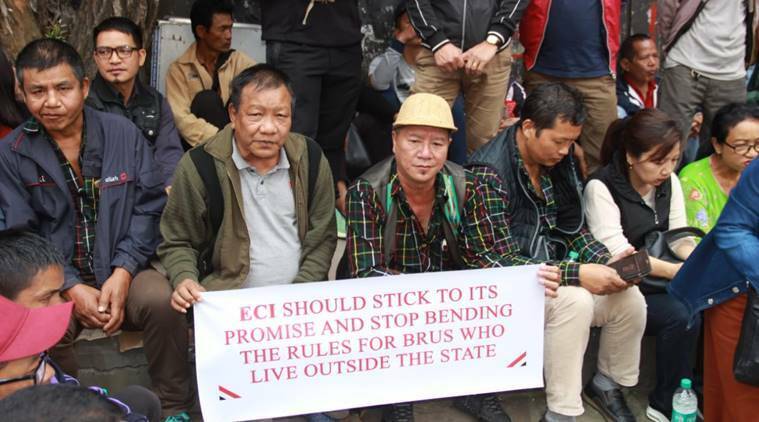 The Brus want polling booths set up in the camps, saying that they feared a law-and-order problem if went to Mizoram to vote. But civil society groups in Mizoram say no electoral process of the state should be conducted outside. “The Bru people living in camps in Tripura were displaced from their homes following violence, the reasons for which I will not go into. Legally and constitutionally, they have their right to exercise their franchise. I cannot go against the law or the Constitution. These displaced people are Indian citizens,” Shashank, a 2007-batch IAS officer of the Arunachal Pradesh-Goa-Mizoram and Union Territory (AGMUT) cadre, said. According to sources, the EC is convinced that Shashank was correct in suggesting the transfer of Chuaungo. The Commission has also justified the decision to remove the official in its letter to office of the Mizoram Chief Minister on Monday. The letter, addressed to the principal secretary to CM Lalram Thanga, states that the Commission’s decision was taken “only after observing in great detail the sequence of events over the past two months”. 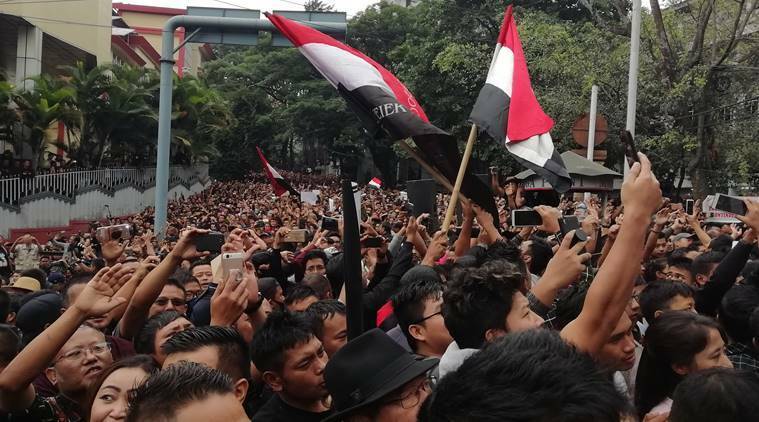 Tuesday’s rally was spearheaded by the NGO Coordination Committee, an umbrella organisation, and saw participation by members of political parties, Church bodies, government employees, student activists and others. Similar demonstrations were reported from at least five other district headquarters.